According to a new market report published by Transparency Market Research, the global data business in oil and gas market is expected to reach a value of US$ 64,845.8 Mn by 2026 on account of digitization across the oil and gas industry. In the years 2015 to 2017, the oil and gas industry’s CAPEX fell considerably; however, the industry is focusing on technological advancements to find optimal production techniques for intelligent development of unconventional resources, and to increase the commercial success rates of drilled exploration wells with computer-aided optimization of processes. Investments in oil and gas industry are anticipated to increase gradually from 2018, further driving the digitization across the industry using data science. The market is projected to expand at a CAGR of 18.9% during the forecast period from 2018 to 2026 driven by the increasing adoption of data management & big data software and solutions, and data monetization in the oil and gas industry. North America is anticipated to be the dominant region in the data business in oil and gas market followed by Middle East & Africa during the forecast period.The upstream application segment is expected to observe flourishing growth due to the rising need for enhanced oil exploration and production to maintain the production and to meet the demand in the next decade with sufficient oil and gas discoveries. The large amount of data generated in the oil and gas industry can be used to discover new oil deposits to meet the global oil and gas demand and to increase operational efficiencies in the upstream, midstream, and downstream sectors of the industry. From exploration and production to trading and retail, classifying and streamlining the massive amounts of data generated with the data management solutions is necessary to optimize functions and enhance safety standards at every stage in the oil and gas industry. With big data analytics solutions, data is analysed to find optimum oil drilling locations and to predict success for new oil and gas exploration. Direct data monetization vendors sell seismic data, well data, production data, and geological survey reports to other companies for producing value from these data reports. The data business market is expected to flourish over the forecast period to integrate and interpret large amounts of structured and unstructured data generated daily from exploration, production, and development of oil and gas. The data business in oil and gas market is segmented based on component, oil companies, application, E&P lifecycle, and geography. Due to increasing digitization in the oil and gas industry, the market is anticipated to experience flourishing growth during the forecast period. By 2026, the upstream application segment will account for more than 56% of the global data business in oil and gas market due to increasing IT spending in the upstream sector of the oil and gas industry. Exploration is the key segment in the E&P lifecycle of the oil and gas industry driven mainly by deep-water exploration activities, shale gas exploration activities, declining exploration costs, and rising focus on near field explorations. National Oil Companies (NOCs) are anticipated to have more than 53% market share by 2026. NOCs are increasingly spending on big data and data management software and services, thus accounting for the maximum share in the data business market. Big data software such as data analytics, data collection, data discovery &visualization, and data management software holds the major share in the big data in oil and gas component of the market with data analytics and data management software driving the growth of this segment. Data management component growth is driven mainly by corporate/enterprise data management software. North America is leading the data business in oil and gas market with 36% share globally. The presence of key industry players, increasing oil production, shale oil reserves, and necessary infrastructure in the U.S. is expected to drive the region’s growth. Asia Pacific is expected to be the fastest growing region in the data business in oil and gas market. 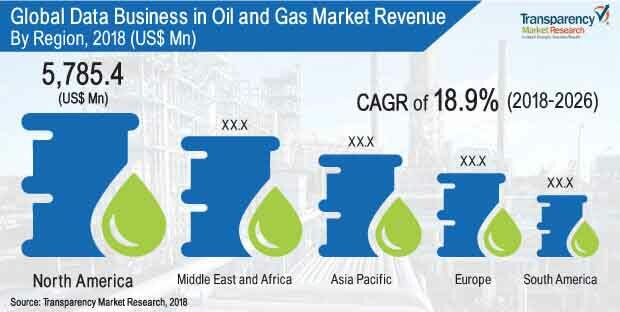 Increasing oil consumption will drive the need for enhanced oil exploration and production in the APAC region.Increasing adoption of advance technological solutions in the oil and gas industry across GCC countries, Russia, China, Canada, and the U.S is expected to offer prominent opportunities to the market.